It's no secret that Nintendo Labo hasn't quite managed to reach the lofty heights Nintendo may have hoped for or expected, but it certainly isn't done just yet. 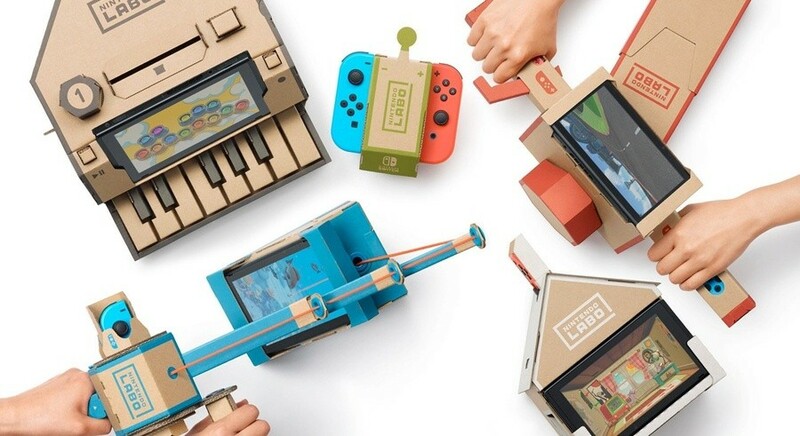 From the start, Labo has been a particularly intriguing venture for Nintendo; rather than the standard marketing process for games, Labo has been pushed as something different entirely, perhaps most prominently as a creative tool for education. Thanks to this, the typical gaming audience didn't hoover it up at launch and it didn't take long at all for it to disappear from the gaming charts, never to be seen again. So what exactly is going on with Labo now, and what can we expect to see from it in the future? Well, Nintendo President Shuntaro Furukawa has touched on this very point in a recent interview with Kyoto Shimbun (translated by Nintendo Everything). Whether "formulating new methods" for Labo means new Toy-Con packs, or simply new advertisement and marketing plans, isn't 100% clear, although it wouldn't be surprising to see more sets arrive at some point this year. The genius at work behind its design, and the pure creativity that can be born because of it, are clear for all to see; perhaps all it needs is a little refinement? What do you think? Do you think Nintendo Labo has the potential to succeed further in the future? Do you own any kits yourself? Let us know in the comments below. It would be nice if they just stopped with Labo. This cardboard stuff is fragile and expensive. @Redax I agree. Accept the loss and put the resources into something else. "certainly isn't done just yet." Despite what everyone said, Labo isn't a big hit. It isn't that blue ocean. It's just cardboard that virtually no one cares about. Yeah. And it's difficult to stock. With 4 children I haven't bothered with it yet. I think the idea is sound, and even new ideas are fine. But I think the problem is that Nintendo's expectations and projections are too high. Labo is great in the creativity field, but it will never have a mainstream appeal that will capture every single human. I think if they lower their expectations and simply bolster it for what it is, then it will still be a win-win. I think they need integrate Labo into more of their big first-party games. Adding Labo support for Mario Kart was neat and actually revived interest in it for a while. Nothing huge; just neat extras for people who've already invested in Labo. Adding functionality like this would help maintain long-term interest in Labo kits beyond the initial novelty factor, which admittedly gets old really fast. It would encourage people to hold on to their kits and make them feel like less of a waste of space. Labo is nice and all but is this really necessary? Still overpriced cardboard that's IMO not very appealing. I'm okay with seeing some new sets. I've enjoyed mine. It's clearly not attractive for everyone, but neither is Mortal Kombat or Mario Party. There's nothing wrong with with having options. The vehicle kit is definitely my favorite, though. More compelling software is the key. No interest in Labo at all. I would rather have more ports or remasters than Labo. Or something new, but prefer a an actual game than some toy. I think Labo is a lost cause. Unless the can get the price way lower about $19.99 to $29.99 would be about right IMO. And seeing how thier basically just lower cost games and cardboard witch cost $1 for 200 pounds I know this is totally doable. I don’t get why everyone acts like Labo was a big failure. The first two did 1.39 Million by June 30th and if they got a solid holiday boost they probably have had solid legs. And remember these things retail for like 20$ higher than standard Switch MSRP. I hate to say this but the more I think about it..... Labo would be better as a service. The shortfalls of Labo are apparent- its fragile, expensive, and gives very limited entertainment after created. I'd even say most of the fun is in putting it together. So why not capitalize on that? Imagine if you could have a new set sent every couple of weeks for $10 a month. Schools would hop on that in a second. TL;DR a monthly subscription is much more justifiable when the product is tangible, like Labo. For $10, I'd totally give it a shot. If I liked it, that 10 would turn to $120 in a year. @Pikachupwnage I think Labo sold nearly as well as PSVR, and Sony isn't dumping that yet, and they aren't calling it a failure either. Even Vive and Oculus Rift which sold worse than PSVR have announced new models recently (Pro announced Quest ). So while Labo isn't selling gangbusters it probably was never meant to. It's a niche product allowing Nintendo to get into schools and education and STEM. It's a tool, not a game. Sales need to be compared to other Stem products, and I haven't seen any of those comparisons. I'd be shocked if these are selling more than 10 or 20k per month. I'd like to see them designed in such a way that they can fold flat and pop up again when you want to play with them, like a pop-up book. Maybe even sell a big folder to store them in. After seeing how much space the first set took up we aren't buying anymore, they are just too big and bulky and don't get played with enough. Our PSVR headset takes up a lot less space. "we’re working on formulating new methods that convey its allure" suggests to me that they're trying to see how they can find ways to shift the existing kits. I'd be very surprised if there were any new kits now. Labo was by no means a disaster, but I'd imagine if you told Nintendo before they spent all the time and resources researching, developing and marketing this whole new brand, that all kits combined would end up selling what they have, I doubt they would have bothered. I think they misjudged the Switch's appeal and audience, perhaps blinded by their "we're the kooky ones" philosophy. Having said that, they definitely still have one sale from me to come, as I will get one for my collection. I always said I'd wait until they were bargain bin prices and it seems they've already come down considerably. I had a lot of fun with Labo. But like @ItsOKToBeOK posted, the appeal is putting it together. The software is bad, but only the vehicle set felt like a game. @CurryPowderKeg79 os not "just cardboard". How much does any game cartidge cost? Including the one that come with labo. They need to stop with Labo. Seriously. Can we have Labo die and the 3DS gets a few more years instead? Thanks. Both are extremely expensive. Amiibo, from the point of view of collecting them all and Labo because it's cardboard and will wear out quickly. And I know that if I bought Labo, after the novelty has worn off it will be put on the same shelf as my PSVR. When it was revealed I was blown away by the invention of it, both for what it is and the money it could potentially make - it seemed like a masterstroke to sell people cardboard kits that they assemble themselves. But maybe it's another thing like the Wii U that didn't connect with the general public. But, Nintendo needs to lower the price of LABO with MSRP = $20 - $30. And the game contents from LABO should be rich as RPG with a lot of explorations. My little bro Stooper101 has both of the launch kits, and they are AWESOME! However, they really should have more software per kit. As people have stated, adding support to MK8D was a step in the right direction. If they added more stuff to do, it probobly wouldn't be worth 30$ anymore. It would just have more reason to stay at the same price. I haven’t bought any Labo kits yet, but I wouldn’t mind picking up the variety kit someday. I imagine this means retooling it's market to more public/shared/event driven sales to schools, hospitals, groups/events etc. That gives it a new market without having to be a "success" as an entertainment product. Fortunately we gamers won this one where Smash and Pokemon sell like wildfire and Labo sells so-so. that means their R&D money will be prioritized more toward the products we like in the immediate future instead of chasing the elusive second market. @rjejr The difference is Sony sees PSVR as a growth potential category. Like Minidisc. But that's Sony's schtick. Dive into a new field, and if there is no market for it, create one, if there is a market for it, try to cement the Sony brand as an early player in that field, so as the field grows they have brand recognition associated with it. VR will never be mainstream, but it is likely to continue growth indefinitely. Labo....it's a cardboard play kit. It's not an early implementation and presence for a future growth market. It's just a toy set with mediocre sales. It's not laying the groundwork for the next 30 years of cardboard entertainment. Save that for the Senran Kakura branded R.O.B. units. The builds needed to be designed first. The blades they are using. They need a unique set of blades, for each sheet. 72 individual blades for 3 packs. Correct cardboard. 2 mm thin. Cost more than the cheap thick kind. Trace them onto the cardboard. Remember to mark and cut the holes and slits. Honestly, I doubt Labo is going to be the kind of thing that can maintain popularity. It is a neat arts and crafts project, but it's the type of thing where you build it, play around with it for a bit and then you're done. After buying the variety pack I never felt any desire to get another Labo kit. @NEStalgia "It's not an early implementation and presence for a future growth market." Then obviously you haven't been paying attention to kids toys the past few years. STEM toys ARE the future growth market. 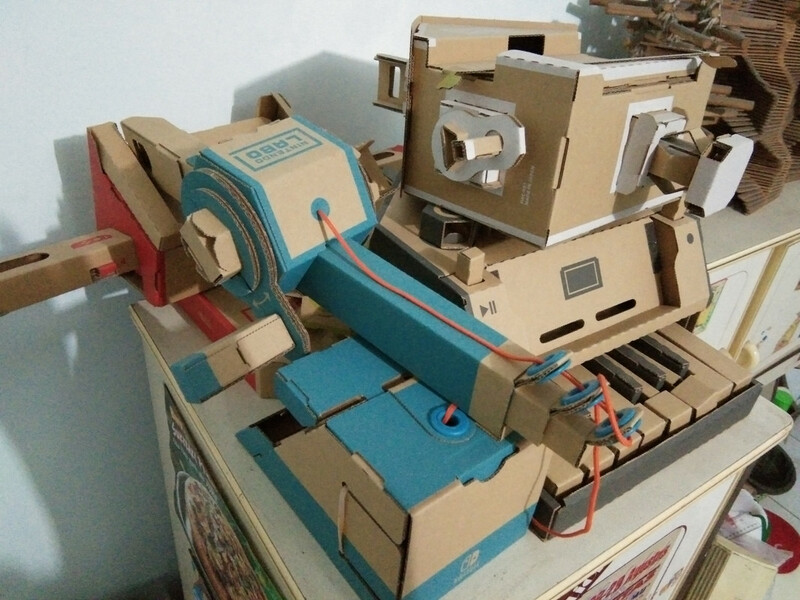 @hakjie11 "I can't re-use my cardboard,"
But you are supposed to be able to find different ways of using cardboard with Labo, that's the entire point of coding in the garage, to use the Labo software and the cardboard in different ways. That's why it should work better as a STEM project than as a toy. Nintendo just needs a way to focus on that aspect and sell it to a select group of people who want to code and play with objects, not try to sell it as video games to video game players w/ cardboard peripherals. The essential flaw of Labo is that it's aimed at kids but is very fragile. Not a good combination. That and its price point. @rjejr They're the current up-market fad for parents to buy things for kids. Trouble is it's a kid-driven economy, and kids will choose the pure fun entertainment every time. Give them Smash or Labo, they'll pick Smash. Give them build your own wood block playhouse or plastic squishy poop....you get the idea. Translation: This was a failure and we need to go back to the drawing board. Let this die and stick with making more games. Have better chance of selling a $79 LE collection of Metroid like KH3 did than this nonsense. I know a lot of adult switch gamers don’t like labo and I’m on the fence about it, but ever since I saw the kit with the house snapped game I’ve thought they should implement a bonus game to animal crossing that uses labo. It doesn’t have to be a requirement to play but if you have it take advantage of this feature. I own all three sets. My kids absolutely love them. I urged my mom to buy one for my nephews who had just got a Switch. She was very reluctant. She didn't think it would be something they wanted. She caved and bought it. My nephews celebrated at Christmas like they won the Super Bowl when they saw Labo. I think there is a disconnect when it comes to buying "cardboard" with parents. My kids love playing Labo, building, and then using the gear for games like Mario Kart. I have a toddler who went from driving backwards on Mario Kart, to finishing in first place once they had the motorcycle Labo kit. They "fish" from the top of their bunkbed like it's a boat. The weird house thing? My daughter shows it to almost everyone that visits. I'll buy any set they release - my kids have had hours of fun with these things. I haven't gotten around to investing in one yet (plus, I barely have enough room to fit even one kit in my house...), but a friend of mine did let me try the Vehicle Kit and I was impressed on how much fun I was having. Sure, it doesn't peak to the likes of Mario, Zelda, or Kirby even, but I wasn't disappointed and hopefully when I have some cash and some more room in my house, I can invest in one of them. On the topic at hand, I think Nintendo should continue with the Labo thing. The creations I've seen people doing with them just blew me beyond the solar system; I couldn't believe my eyes. And to those people saying that they want the Labo to end: If you don't like them, don't buy them. Nintendo is all about gathering families and friends around. They don't always have to cater to you folks. @Kirby-in-Kirkby It is not as fragile as you would think. It is made remarkably sturdy. @NEStalgia "and kids will choose the pure fun entertainment every time." You must live in some totalitarian world where kids only get 1 gift for their birthday or Christmas. Our family tree probably had over 100 gifts under it, and I'm not exaggerating. Some were clothes, some were toys, some were videogames, some were edutainment. My kid just got another 5 or 6 gifts for his birthday. Who can count. So yeah, kids choose what they want. Then parents choose how many "fun" things to buy, how many toys, how many videogames, how many pieces of clothing. Just b/c videogames sell better doesn't mean STEM toys don't sell. And if STEM toys are a fad I suppose smartphones are to, and we'll all be back to using landlines any day now. I'm not saying Labo is going to make it. Wii U didn't make it and that's certainly better than Labo, but STEM toys aren't going anywhere. 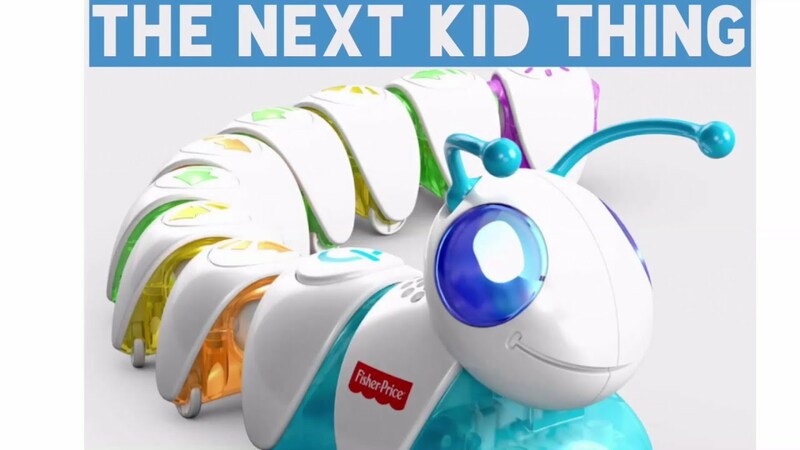 Sure, any one toy will die, that centipede probably only has another year or 2 left before it's gone, but as long as parents keep making babies, grandmas will keep buying them STEM toys. Some things just don't die. Lego, Play-Do, dolls, action figures, and toys that make noise. @rjejr Sure STEM toys sell, video games sell better....which is Nintendo's statement....the LABO doesn't sell as well as the hit games. Investors don't want to hear about "what products will you bring that don't sell as well as your other popular products", they want to hear about new markets, new revenue streams, or new more popular things than the other things. Well...Apple stocks are tanking as iPhone sales are in the tank...so....there it is.... Funny thing about smartphones. They sell like crazy.....investors thought it was forever....until the market is saturated. The same thing happened with beige box PCs in the 90s. Once everyone had a good enough one they stopped buying new ones....again, investors were confused and shocked. Same thing happened with radios in the 1940s. It almost took down RCA....investors were shocked and confused that the fad burst! They never learn! But STEM toys are a plaything of ambitious upper-middle-class parents with dreams of high end careers for their genius offspring. The masses just want to keep the kids happy and entertained, not wire them to be insurance litigators with an in at Yale. @rjejr I actually think they should go full-on STEM. Add in the ability for the user to design something versus just decorating and I think this would be very valuable for both entertainment purposes and educational purposes. I had a lot of fun building the Labo and it was fun to play with for a bit and the piano still blows my mind and the fishing rod is pretty cool too. The problem is the software is far too shallow with very little to hold your interest after an hour or so. There's definitely something in the concept but perhaps something more robust or a deal with Lego? @Pikachupwnage Thank you. Too many clueless comments here based solely on personal views that don't "get it". The vehicle kit was a big step forward for Labo, I hope more similar kits are released. Maybe don't lock regular game reviewers out of reviewing them. I know that they're unlikely to "get it", but there's also the possibility they might convert some of the skeptics in their audiences. The entitlement is ridiculous. This isn't for you. Stopping development and moving resources away from LABO will not get you another Zelda. They will make something else that targets this demographic and not you. You already have a Switch and are a Nintendo fan. I have seen 4 year olds building LABO and experiencing something magical. They are now Nintendo fans, like you. Missi0n accomplished. Nintendo deserves all the praise in the world for c0ntinuing to manufacture toys. Otherwise, they would just be another c0nsole and we already have 2 of those. The market will decide. If children want this, then it continue. Im not praising Nintendo though. Buying a Switch and then some of these kits is expensive for many. They are charging a premium for very basic games and a bunch of cardboard. Implying that "traditional gaming audience" was ever the target one. There's zero surprise that Labo has yet to catch up with the likes of Mario, Zelda and Smash that manage to appeal to both. And there's equally zero surprise that Nintendo isn't done with this venue. Labo is distinctly Nintendo, and Switch is the only kind of console you can pull it off with. It’s great but just don’t have the space. I personally think they should bring kits out specifically for games. Imagine for a second if Nintendo paired up with Sega and made a card board steering wheel for outrun, handlebars for Super hang on, Starfox yoke controls with joycon features. Just an example but these are the types of kits that gamers might find more interest in buying I know I would. Isn’t it interesting... the people who are commenting on how not great Labo is... isn’t the target audience... and when it comes to the price, you are not paying for “just cardboard”. Your paying for the software, the doubtless hundreds of hours spent designing these things so kids can build these intricate machines, and then even more time spent programming the software to work with cardboard... That’s quite a lot. Part of me thinks it would be better to prioritize it to schools and educational services rather than the general market. I wonder what can eventually come from LABO. In 10 years time, we may all be fondly recollecting when it was 'just cardboard.' They should stop developing this product when they have genuinely reached a dead end creatively. Nintendo have a history of turning commercial disappointments into pioneering gaming. So quit ya calls for stopping exploring their ideas. Just don't buy it if you don't like it. Sheesh. No one likes a moaning Minnie. @Dman10 Do you want something new? Then buy Labo, that's as original as it can get. Just make more Mario Kart 8 and BotW DLC. I think Nintendo should give up on Labo and try something else. Kind of what I expected. Not a colossal failure but not something particularly great in sales. They may release another kit or two if their developers already have another ready, but I think it's best to move them to making other "blue-ocean" titles. Perhaps a Nintendo Switch Sports, or something similar? Im a Labo fan. It's great innovation and creativity coming from Nintendo. It doesn't matter if this one wasn't a roaring success, I'm just glad they are still experimenting with new ideas and thinking outside (and inside) the (cardboard) box! I'm actually a bit shocked at the lack of interest and generally negative feeling towards Labo here – but I think most people commenting in this forum are either not really the main target audience, or they haven't tried it. And in fairness it's hardly surprising it's not a lot of people's cup of tea. But I don't think this forum represent the viewpoint in general towards Labo. I'm sure there are many families out there that got a lot of fun and group enjoyment out of the variety pack in particular. If nothing else we'll be talking about Labo in 25 years the way we talk about the VirtualBoy now – as a failure for sure – but still as an interesting historic gaming curiosity. Personal I love stuff like the VirtualBoy success or not. So I hope it lives a little longer. I doubt it's interfering with Nintendo's core game releases and it is another reason for people with young kids to get a Switch – which for EVERYONE means their console has a bigger user base – which means EVERYONE gets more of the games they want. To me it's win, win and Labo can keep doing it's zany thing. @Axelay71 Very cool idea. That could keep interest. People are more willing to give new innovative ideas a go if it relates to an existing IP they love. @Elvie you know the idea of having it be a focus towards schools isn't a bad idea at all. If Nintendo put some ingenuity funding a bursary or scholarship for students who can develop new ways of using labo. Labo, the Rob the Robot, Super Scope, Hey You Pikachu, plastic wii accessory, wiiU gamepad of its day. Looks cute for kids though. No sh*t Sherlock, but it not selling like Zelda or Splatoon does not mean it's a failure. I'm not surprised it hasn't sold well. I was skeptical of it when it was first announced. I just don't see cardboard as a proper accessory for a video game. Apparently, a lot of other people thought the same way. Labo isn't bad at all, had much fun while assembling toys. But its custom editor is too simplistic, they need to enhance it here & there so you can build some really fun stuff . @gortsi No idea where you getting your numbers from. But last count LABO was at 1.3 million (all kits combined) and Detroit was at 2 million. And respect from developers in Japan. @NEStalgia I definitely disagree about STEM toys being for the middle class parents and kids. Lego was a big part of my household growing up and although we couldn’t afford the Death Star and all that, just having the bricks and being able to make our own fun time and again with the same bricks was probably better value for my Mum than buying a million different plastic caterpillars. Teaching kids to be creative is really important and if Nintendo can make it fun and intuitive, they’ll carve their own path in the edutainment sector. Just look at all the V-Tech ‘game consoles’ parents have. If Nintendo can capture that sector, it’ll be a win plus with the family owning a Switch, there’ll be room to sell traditional games too. If Nintendo has found something in LABO's sales that convinced them that they should keep it alive, then there were results. They clearly weren't the results they wanted, but they were results that exceed a notion that "virtually no one wants this" because whoever thinks that are mostly thinking within their own bubble and have no actual awareness of how a company can handle multiple projects. buy labo and stick it in a box and do not touch it for many years. Because it is a consumable item, in many years unused labos will be worth money. For creative people, there is lots of potential. It's cardboard! Nintendo Labo is CARDBOOOAAAAARRRRD!!!! Complaining about the "price of cardboard" is tantamount to suggesting digital games should be essentially free due to the negligible distribution costs. Human beings only have a few dollars worth of salts and minerals in them - clearly it's about how things are put together. I also wonder whether people claiming the product is fragile have actually used it, or whether they just have rampaging kids/pets tearing everything apart. It's actually very sturdy and well designed. I had a lot of fun making my Labo set, and some short-term fun playing the software (particularly the fishing game). If they improved the software experience I'd be keen for more. 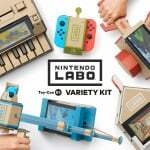 Labo just needs to drop in price period. Put the kids down to $30 to $40 and they'd start moving some units. $70 to $80 is still too much. @ItsOKToBeOK Despite not being a fan of NSO (I mean, who is? ), I'd totally be down for that. @e0ne0ne This is the bit I find ridiculous, people who it's clearly not aimed at, complaining about it. The Very Serious Gamers™. They moan about cardboard (from a design point of view I consider it genius), yet in another article you'll see them crying because Nintendo aren't telling them when a game with a cute fluffy dinosaur is coming out. Nintendo always comes out with "new ways to play". This is a new way to play. It didn't go down as well as expected, but at least they had the balls to try it. Another plus is if they end up with surplus, it's environmentally friendly and can be pulped easily. Yeah great concept, but execution poor. @sybno1 I would argue that conversely, the execution is actually better than the concept. That's a really nice point. However as a side note I think we would probably all agree digital games certainly should always be at least slight cheaper in comparison to the physical counterparts. The mark-up seen on some digital products is one of the biggest cons of resent times – and Nintendo are one of the worst at this highly questionable business model. But in general I've always felt the argument about materials and 'the disgraceful price Nintendo is charging for cardboard' is people talking right out of their bottoms. Let's take your iPhone XS or Samsung S10 that some people pay £900 - £1200 for as an example; how much do you think the material cost is? Answer is: it's practically nothing compared to the horrendous prices of recent phones that a lot of people are still willing to buy without a complaint. The point is, in both cases, you're not really paying for the materials – but the innovation of the products built with those materials. It's not like when you buy a new smartphone you're after the plastic, glass and a bits of metal. So can we please get beyond this dumb 'it's just cardboard' mindset. I think they should try something new. LABO is great and all but it seemed to struggle with who it was targeted towards: Too complicated for children, too expensive for education, too childish for adults and not much mass market appeal. I think it really only sold to Nintendo fans and specifically those adult fans who wanted to involve their children. But I'm sure they have plenty of ideas for products. No sense in pinning your hopes on just a couple. "nobody wanted this - nobody wants this"
"It's cardboard! Nintendo Labo is CARDBOOOAAAAARRRRD!!!!" YES, it's CARDBOARD made by Nintendo. Nintendo will NOT stop making LABO. LABO Toy Con 04 (Camera, Bird, etc) probably will be released on this year very soon. They should consider dividing the items to make them cheaper and have the software as a download only. I'd like to try the piano but I don't want to pay for the rest of the variety pack. Eh. I think it’s really cool. I was definitely impressed when they revealed it. But I have no interest in it and don’t really care what they do. Well Obvious nobody is taking those accusations out on the game those same employees spent years making - That is on David Cage and Philippe Limantour - But nice try. @NEStalgia "they want to hear about new markets, new revenue streams, "
Which is exactly what Labo is for Ntineod, something besides video games. A little money on the side for little effort. And if it Labo should happen to get popular enough to sell some Switch - it wont' - but if it did, then you take some kids at school playing with Labo to going home and telling their parents to buy them Switch, and explaining to their parents it' snot just about video games, it's about learning. Edutainment is a back door for video game console sales. Now me personally, I would have let Switch be out for 3 years first and have a 60m install base before trying to sell cardboard STEM toys that requires a $300 console to work, but thats' just me. Labo isnt' special enough to sell a lot of Switch, but if there are enough Switch already out there people would buy Labo as a STEM toy for it. Which is probably why Nintneod isn't giving up on it yet. Antimatters photo isn't helping though. "Buy Labo! But build a new room to store it in first." To be fair a lot of American homes do have the room for this stuff, but I can imagine a lot of families not wanting to fill up that space up with cardboard. Smaller kits. Cheaper kits. More coding involved kits. They have a few more years to figure it out. But it's never going to sell like Mario or Zelda. I'm not surprised. Firstly, The marketing was kind of weak. Nintendo said it was for kids but even kids sort of don't like it when people say their game is for kids. Also, though a lot of toys come to life games have been having sales issues. I think expense is a big part of why. Because you could always do the same with digital goods and be way cheaper. Sometimes these things can also be a bit finicky to set up and change around. Gamers find it annoying and kids may think it's too hard. Labo might not have enough content in some of the modes to merit all that time setting it up. It's not like it's for an open world or something. Some if the modes look pretty basic. @Deljo No, but I just looked it up and it sounds like the sort of game that would make me set up the PSVR again. Labo Duck Hunt! That would be amazing! The engineering behind this is really cool. Whoever designed each project and then applied it to cardboard that can be popped out, folded, and built and then wrote the software that conveyed the ideas of how to build it so even younger children can build and enjoy the labo is very talented. Even adding in a little humor is a nice touch. Half the fun is just building the projects and then allowing very creative people to run wild with ideas and applications. It is obvious that a lot of thought went into Labo.